The power of social media is more apparent than ever. Already this year, we’ve seen the Netflix film Bird Box spawn challenges that made people run around blindfolded and a stock image of an egg that went viral and beat Kylie Jenner’s world record, amassing the most likes of all time — more than 50 million. Now, everyone is throwing it back for the #TenYearChallenge to show how much (or how little) they have aged in the past decade. I happily jumped on the bandwagon and showed off my laugh lines with pride — until I stumbled on a friend’s version and resolved that he must either be a fresh-faced vampire or a time traveller. But of course that wasn’t the case; he’s in fact just a happy and healthy Greek. It turns out that the Greeks do have the answer to a longer and happier life. Regularly appearing at the top of the longevity lists and living past 100, it all comes down to the Mediterranean diet and lifestyle. But it’s not all about eating healthy salads and olive oil — it’s also about taking the time to enjoy it. We’re talking about a good amount of rest and unhurried meals with loved ones, on top of clear blue waters and a sprinkling of sun. Unfortunately, we’re a little far from Santorini for that part. Artemis & Apollo offers a taste of the Mediterranean in Hong Kong. Unable to hit the sunny islands just yet, we instead visited the newly opened Artemis & Apollo. Nestled in Wan Chai’s cool neighbourhood of bars and restaurants on Moon Street, the new restaurant bears the distinct hallmark of a Black Sheep Restaurant and is already full of patrons looking for a good time. The modern Greek taverna has been designed by celebrated interior architect and designer Sean Dix. Sliding doors open up to a contemporary-style taverna which seems narrow at first, but actually curves over to another side, revealing a twin dining room, in honour of the restaurant’s eponymous Greek twins: the goddess of the hunt (Artemis) and the god of music (Apollo). Domed ceilings help open up the space, which also features whitewashed walls complemented by natural walnut wood furniture and olive green seating. The atmosphere emulates that of a family-run taverna in Athens; it’s relaxed and welcoming, lively with music and the buzz of conversation. There’s also a courtyard in the back for alfresco moments when the weather warms up. Head Chef Andrée LeFuel previously worked under esteemed chefs such as Daniel Boulud and Ludo Lefebvre. The menu is concise, but its brevity bodes well for dishes that are executed well and, luckily for the drinkers at the table, makes way for a rather impressive Hellenic wine list too. We opt for the recommended Atma Red 2016 from the Thymiopoulos Vineyards, which is refreshingly smooth and fruity, with strawberry and pomegranate on the nose. The staff are knowledgeable and we hear all about Head Chef Andrée LeFuel’s passion and experience in the cuisine, having worked in fast-fine Greek restaurants in San Francisco, which helps to build our anticipation for his elevated traditional Greek food, made for the modern discerning diner. Dinner begins easily with some mandatory mezze, including a creamy hummus and tzatziki Theodoros that I scoop up enthusiastically with warm pita and vegetable crudité. It all feels very healthy, so we balance that out with the hearty saganaki platanos (a dish similar to the pan-fried halloumi at sister restaurant Maison Libanaise). Here, saganaki, a native Greek cheese made from the milk of both sheep and goat, is cooked on a cast-iron skillet with candied apricots and honey, resulting in a caramelised, savoury and chewy appetiser. Left to right: Spanakopita, hummus and marinated olives. This is followed by spanakopita, a golden triangle which is brought to the table and cut with scissors to reveal a rich spinach and feta filling which is a touch too salty, but saved by the perfectly layered, crispy and buttery homemade filo pastry. Another winning dish for us was the deep fried calamaraki with pickled chillies. Made with fresh calamari marinated in yoghurt which helps to tenderise the seafood for an easy bite, it’s served with a squeeze of lemon, a side of tzatziki and tomato curry sauce. Halfway through our meal, a glass of Ouza 12 — a fiery, anise-flavoured liqueur made from crushed grape skins and aromatics — is poured, and we graciously oblige. My fear of shots subside, as we enjoy ours with a little water mixed in, turning it milky-white in colour and fresh with herbaceous and intense notes of liquorice. Pictured here: Saganaki platanos and Steki tou ilia lamb chops. 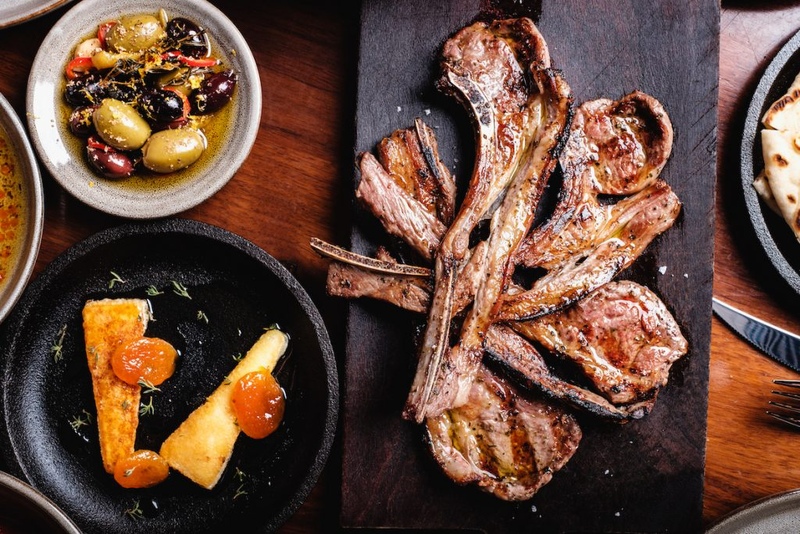 Back to our main course of spit-roasted meats: Chunky pieces of pork souvlaki are delightfully smoky from the charcoal grill and sliced to serve, while steki tou ilia lamb chops, an homage to Athens, are served by the kilo. It’s a huge dish and we enjoy the tender meat with Greek-style harissa yoghurt, but the fibrous herbs scattered on the lamb keep getting stuck in my teeth — a slight annoyance. By this point in our meal, the noise level (along with the amount of people) in the restaurant rises significantly and we can barely hear each other as we quaff the remainder of our drinks. But the show must go on and a Greek meal wouldn’t be complete without beloved baklava. Artemis & Apollo’s version is little heavy handed on the syrup but incredibly crispy and nutty, even after I saved one and put it in the fridge for a few days. Upon finishing my epic Greek feast, I feel satisfied. My stomach is full of great food and I enjoyed an evening with interesting company (when I could hear her), exceptional service and copious amounts of wine and drinks. It’s somewhere I would like to revisit, so much so, that I leave feeling radiant, probably glowing from the Ouza, but also because I finally found the thing keeping my Greek companion looking so happy. Perfect for: Group dinners and drinks with friends in a casual and lively atmosphere. Hours: Open daily from 6:00pm to 11:00pm.